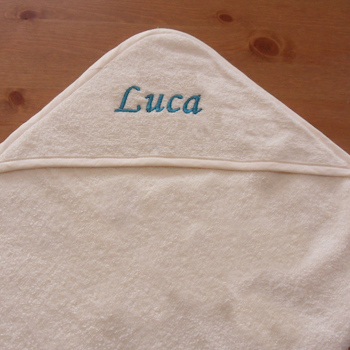 A useful gift for baby boys and girls a cream hooded towel with cream trim in your choice of embroidery thread colour for a personalised name. This cuddle towel will make an special and unique gift for a baby shower. A useful gift for baby boys and girls a cream hooded towel with cream trim in your choice of embroidery thread colour for a personalised name. This cuddle towel will make an special and unique gift for a baby shower. Just fill in a single name or initials for us to embroider and select your favourite thread colour and letter font style.